Click to download example developmental edits. Developmental edits are big-picture items—chapter structure, does the world make sense, do the plot twists work, are the characters believable, how is the pacing, is the prose distracting, etc. You might hear them called “substantive” or “content” edits elsewhere. To Jeff’s mind, they’re the most important kind of edits, because they deal with the heart and bones of a story—the things that lead it to live or die in a reader’s mind. They’re particularly so for indie authors, whose readers tend to care more about story than about polished prose. Jeff’s rate for developmental edits is $75 + $.010 per word, or $10.00 per 1,000 words. Editing is available on a piecemeal basis, but not working with a contiguous manuscript deeply undercuts Jeff’s ability to provide good big-picture editing. 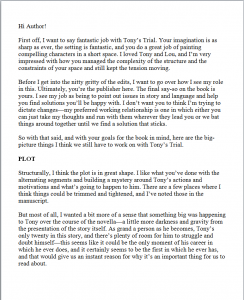 For a free sample developmental edit of your first ten pages, e-mail Jeff here. Click to download example line edits. 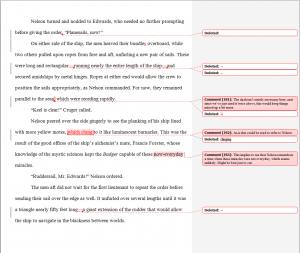 Line edits are sentence-level edits focused on word choice, syntax, paragraph structure, speech tags, redundancy, etc. To Jeff’s mind, they’re essential to creating a polished product. They help you ensure that you’re saying exactly what you want to say and that readers won’t get hung up on your language. As line edits can be extremely time consuming, Jeff asks for sample pages before agreeing to line edit a manuscript. Though it will produce a very clean manuscript, line editing is focused upon style, clarity, and content; it should not be confused with copy editing or proofreading. Examples are available upon request. Jeff’s rate for line edits starts at $25 + $.014 per word, or $14 per 1,000 words. Editing is available on a piecemeal basis, and Jeff does reserve the right to return manuscripts if the sample pages he received were not representative of the overall quality of the work. You will not be billed if your manuscript is returned in this fashion. For a free sample line edit of your first ten pages, e-mail Jeff here. Line editing and developmental editing are available in conjunction at a discounted rate starting at $100 + $22 per 1,000 words. Outline reviews are intended to help writers who want to draft more efficiently or who don’t have the budget for a full developmental edit. Jeff will provide you with a ten-page document that’s part theory primer and part worksheet. It’s designed to get you to identify the core needs of your story in terms of plot, character, structure, voice, setting, theme, and pacing, as well as how you intend to fulfill those needs. After you fill out the worksheet, which includes a detailed chapter-by-chapter outline, Jeff will review it and return it to you with comments and suggestions. The worksheet can be used before drafting, after drafting, or if you’ve hit an intractable problem mid-draft. Developed by client request in conjunction with several successful authors, the process has helped Jeff Does Books clients streamline their drafts, make better use of their limited writing time, and understand how their stories work on a technical level more completely. Jeff’s rate for an outline review is $350. Copy edits are focused strictly on grammar and mechanics. Jeff will go through your manuscript with a fine-tooth comb looking for any errors in spelling, grammar, or formatting and correct them, occasionally making notes and queries in the manuscript margins. Because copy editing can be extremely time consuming, Jeff asks for sample pages before agreeing to copy edit a manuscript. Jeff’s rate for copy edits starts at $25 + $.014 per word. Proofreading is similar to copy editing but less intense. Jeff will read quickly over your manuscript looking for glaring errors in spelling, grammar, or formatting and correct them. Because proofreading is only appropriate for manuscripts that have already been copy edited or line edited, Jeff asks for sample pages before agreeing to proofread a manuscript. Jeff’s rate for proofreading is $.008 per word, or $8 per 1,000 words. Second reads are additional visits to works Jeff has already performed either developmental or line edits on. You and Jeff will discuss what you’d like him to look for as he reads, and you will receive a Word document outlining his thoughts on the topic. Second reads are available at the rate of 8$ per 1,000 words. Cover copy is available for any work Jeff has already read in its totality for $115 per item. Cover copy is typically one to three paragraphs of marketing copy, can be optimized for search engines or print, and includes two revisions. 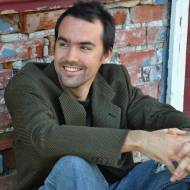 Jeff’s professional experience lies primarily in science fiction, fantasy, horror, mysteries, and thrillers, but he will accept manuscripts in most genres. Turnaround times will vary, but in general, estimate one week per 50,000 words. For your convenience, a table of pricing is below. First, you and Jeff will agree to a schedule outlining deadlines and price, and you will give Jeff a Microsoft Word or OpenOffice document of your manuscript to work from. Jeff will e-mail you a basic contract laying out the terms of the work to be performed. Once you’ve agreed to the terms and Jeff receives a deposit of 50% of the total cost of the work, he’ll start editing. On or before the deadline you agreed upon, Jeff will return your manuscript with his remarks annotated in the margins using the Comments feature of your preferred software. For line editing, he will suggest mechanical fixes using the Track Changes function of your preferred software and make stylistic suggestions using margin notes. You will also receive a separate document outlining his overall thoughts on your manuscript. After you receive your letter and manuscript, the work you’ve contracted for is over, but Jeff is always available to his clients to answer questions, bat ideas around, and talk shop.